There are innumerable places around Kolkata whose history is lying deep under the layers of time. Mayapur is one amongst these historical places and is known for its beautiful and ancient temples. However, it also hosts several natural beauties in and around the presence of Jalangi river, which is flowing in its vicinity. If you are looking for some memorable time away from the crowds of the modern city into the calmness of nature and liveliness of history, then you have reached the right article. Read on to know more about Mayapur and how to plan a trip from Kolkata to Mayapur. 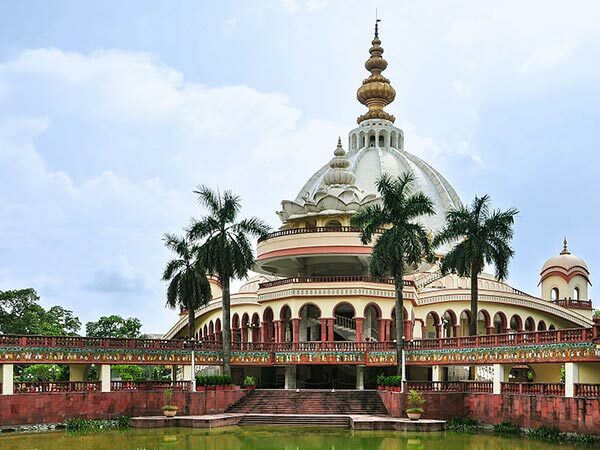 As the temperature remains bearable throughout the year, Mayapur is a year-round destination. However, if you are looking to avoid summers and explore Mayapur without its uncomfortable weather, the best time to visit is from August until the end of March. By Air: The nearest airport is at Kolkata only at a distance of around 117 km from Mayapur. By Rail: There are no direct trains available between Kolkata and Mayapur. However, you can take a train from Kolkata to Nabadwip railway station, which is at a distance of around 30 km from Mayapur. Once you have reached Nabadwip, you can hire a cab to Mayapur. By Road: You can easily access Mayapur by road, which is located at a distance of around 130 km from Kolkata. However, route 1 is the fastest as it will take an approximate time of half an hour lesser in comparison to route 2. Once you are on your way to Mayapur, you can take a break at Ranaghat and explore its natural beauty. Ranaghat is situated in the Nadia district at a distance of around 78 km from Kolkata and is popular amongst local tourists for housing several temples and for its natural beauty in the form of flower fields. It is also popular for its handloom industries. The major places to visit in Ranaghat include Ranaghat Forest, Pal Chaudhuri House, Siddheshwari Temple and several other ancient buildings. You must take a break at this perfect en route destination if you are looking to take a break amidst a peaceful and fragrant environment. Located at an approximate distance of 52 km from Ranaghat, Mayapur is one of the most beautiful towns in the Nadia district of West Bengal. Known for its ancient places and temples, Mayapur is also a major pilgrimage site in West Bengal. From ISKCON Temple to the temples dating back hundreds of years, Mayapur hosts everything to surprise its visitors as you can also visit its beautiful Jalangi river and explore its surroundings dipped in the world of retirement. Following are the major places of interest in Mayapur. ISKCON Chandrodaya Temple is one place in Mayapur which should not be missed in any condition. Apart from the speechless beauty of this temple, there is a lot to learn about its history. It is an important pilgrimage site amongst Hindus who come here to pay respects to their lords and give them offerings. The major places to visit inside in the compound of this ISKCON Temple include the Samadhi of Srila Prabhupada, the founder of ISKCON, the main temple, lush green gardens and deities of Sri Radha Madhava. The presence of water fountains and trees all around the temple enhances its beauty and charm. Yogapith Temple is a must-visit destination in Mayapur as there is a lot to learn about the Vedas, meditation and yoga within its boundaries. It is the birthplace of Chaitanya Mahaprabhu as you can still find the neem tree under which Chaitanya Mahaprabhu was born. Apart from visiting its sanctum and paying respects to the shire, you can also find several clay models and sculptures depicting the life and philosophical thoughts of the saint. So, how about taking a short trip within its walls? Sri Chaitanya Math was formed by a guru named Srila Bhaktisiddhanta Sarasvati Maharaja who belonged to Gaudiya Math. It is one of the major attractions in Mayapur and is visited by hundreds of followers on a regular basis. Sri Chaitanya Math has four alters which are dedicated to gurus namely, Visnnuswami, Ramanujacharya, Nimbarka and Madhvacharya. Chand Kazi's Samadhi is a must-visit place for you if you would love to hear about the stories of transformation in a human being. It is said that Chand Kazi opposed the Harinam Sankirtan Movement in Mayapur and the thoughts of people leading this movement. Being an Islamic person, he did not believe in any other thought and religion. However, later on, due to the grace of Shree Chaitanya Prabhu, he transformed himself and started following Chaitanya Prabhu. Hence, the samadhi was made in order to honour him.